Older people are less protected by vaccines than younger people. A new study has found that vaccinations in the morning are more effective than the afternoon. This adds to the range of factors which change the effectiveness of vaccinations. In young people the amount of antibodies can increase up to 80% when they are given a flu vaccination. Whereas in older populations the production of antibodies is between 30% to 50%, so the protection from infection is less effective. The reason is that the immune system weakens with age. Besides changing with age, circadian rhythms, which vary during the day, also affect the immune system. In the research about 300 adults over 65-years-old were vaccinated either in the morning (9-11am) or afternoon (3-5pm) against three strains of influenza. One month later the follow-up showed that people who were vaccinated in the morning had higher amounts of antibodies to fight off two seasonal strains of influenza. It is not clear why there wasn’t any difference in the third strain between morning and afternoon shots. “We know that there are fluctuations in immune responses throughout the day and wanted to examine whether this would extend to the antibody response to vaccination. 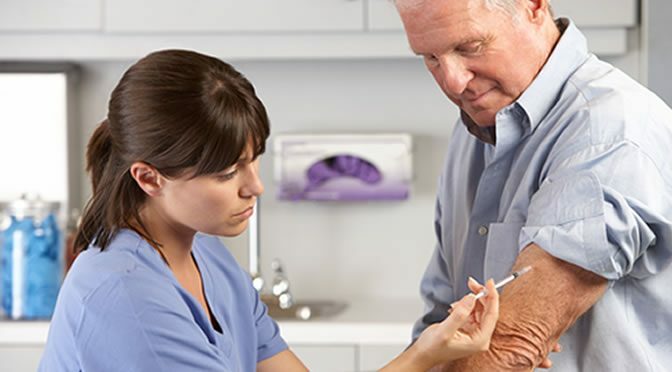 Despite the fact that the influenza vaccination in patients aged over 65 is part of the seasonal vaccination programme across many countries such as the UK, the virus is responsible for the deaths of up to 500,000 each year worldwide. With ageing the immune system declines and the ability to produce enough antibody responses after vaccination will reduce dramatically and so the effect of vaccination is compromised. “A significant amount of resource is used to try and prevent flu infection each year, particularly in older adults, but less than half make enough antibody to be fully protected. The study was published in Vaccine (Long et al., 2016).